We all now know, for a fact, that in the heart of suburbia there beats the whisk of a loving Beta male who keeps his foxy lady pumped up with plenty of well deserved praise. But long before Kel Knight there was Darryl Kerrigan, king of The Castle. House proud to the extreme, Darryl (Michael Caton) massages his lovely, Coogi jumper-wearing wife Sal (Anne Tenney) with a never ending stream of compliments, and the constant glow on her face radiates satisfaction in the bedroom too. Darryl is undisputed master of his domain at 3 High View Crescent, Coolarro – a modest, unfinished home built on a lead landfill with plastic lace iron trim to give it that Victorian feel and a fake chimney for charm. Set snug up against the cyclone fence separating it from Melbourne airport, this dwelling has provided shelter for the Kerrigan family for years. The kids all grew up here; young Dale (Stephen Curry), Steve (Anthony Simcoe) – a serial Trading Post addict, Tracy (Sophie Lee) – recently married off to Con (Eric Bana) and Wayne (Wayne Hope) – currently doing time for armed robbery. The house is chocka block full of all those memories that give a life meaning. So when an order comes through for its compulsory acquisition, the family, and in particular its patriarch, has little choice but to defend it. The Castle tells the story of how these Aussie battlers take on a multi billion dollar development project with nothing but a low rent conveyancy lawyer and decent human values. 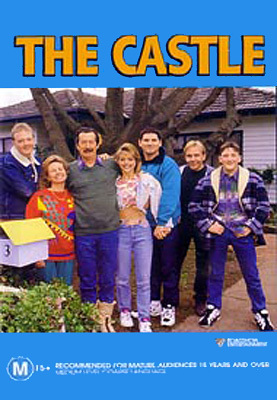 Created by the team that brought us the riotous comedy series Frontline and directed by that show’s star, Rob Sitch, The Castle has become one of Australia’s all time favourite films. It shamelessly portrays us as a pretty bloody thick bunch with an almost moronic narration by young Dale Kerrigan that doubles up on virtually every line spoken as dialogue. But no matter how stupid the characters are, we always root for them. They are, after all, the underdogs. Citing Mabo as a precedent, they present a ridiculous yet persuasive case for everyone, no matter how marginalized, to have a right to a home in this sunburnt country.